Staying healthy can feel overwhelming. If you are caring for another person daily, you may feel guilty tending to your own needs. Perhaps guilt costs you the amount of time it takes to build healthy habits that eventually form a lifestyle. Therein lies the age, old question: where do I start? What if you began by making small changes? Meet your new, super-healthy best friends: Apple Cider Vinegar (endearingly referred to as ACV in our household) and Turmeric. These are popular kitchen items. Entire books have been dedicated to the many health benefits these two ingredients offer! 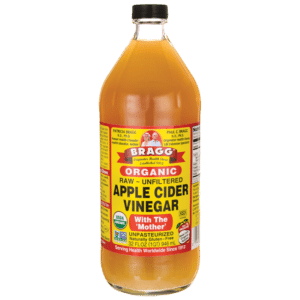 ACV helps regulate blood sugar and supports a higher level of good bacteria in your gut to aid the digestive system. Many health issues stem from having an unhealthy digestive system. Healing our guts is critical for physical transformation, which makes ACV a real hero. Warning: not all ACVs are created equal! I highly recommend using the brand Bragg. It is organic, unfiltered, unheated, unpasteurized, and it still contains the “mother” (a swirly strand in the liquid, but it is a string of protein molecules that carry extra benefits). Turmeric is another ingredient that you can easily find in the spice section of any grocery store (look for a bright yellow/orange bottle). It is known for its anti-inflammatory benefits and it contains antioxidant, antiviral, and anticancer elements, too. It also lowers your cholesterol levels and improves liver function. A win-win! So now you know that ACV and turmeric are healthy for you, but how do you include them into your lifestyle? Mix all of these ingredients together in a mug and enjoy! If the flavor is too bold to handle at first, feel free to mix in a bit of local honey. Also, give your body time to adapt to the flavor. If you can’t handle an entire mug the first day, drink as much as you can, and try for more later. You will eventually get used to the taste and soon start craving it! Cut red cabbage into bite-sized strips and sauté them in a pan with coconut oil and a red onion. Once that has cooked down a bit, season with it sea salt, pepper, AND a few dashes of ACV. It will sweeten up the dish for you, while sneakily getting you those extra health benefits. Steam cauliflower in a pan until it is soft enough to mash (for additional flavor steam with shallots and garlic cloves). Once you have mashed everything into a serving dish, add a few teaspoons of turmeric. Again, the taste will not be noticeable in the dish but the benefits will be! Do not be alarmed if your turmeric turns orange. Turmeric has a potent color but not a strong flavor, so you can get away with adding more into the pan than you think. NOTE: This feature references information from Web MD, Health, and Bragg. If you have some great tips to share about boosting your immune systems…share them with us!